All four main ligaments contribute to rotational stability but the most important in terms of rotation is the Anterior Cruciate Ligament. A collection of smaller ligaments at the back on the outer aspect of the knee (the posterolateral corner, PLC) also add further stabilisation to rotational forces. Any of these ligaments can be injured, and occasionally more than one is damaged. MRI scanning is very useful in knee ligament injuries as it clarifies the precise damage sustained, including tears of the menisci and articular cartilage. The mechanism of injury in MCL tears is usually an acute sideways force that pushes the knee inwards thus stretching the MCL (valgus injury). Depending on the amount of force, three degrees of severity of MCL tear are recognised (see picture). Pain is immediately felt along the inner side of the knee. The ACL comes from the back of the femur within the knee and attaches to the middle of the top of the tibia. It stabilises the knee to forward translation and is important in rotational stability. 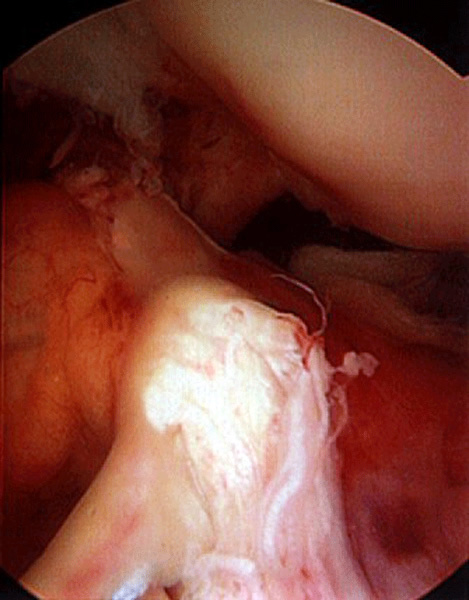 The mechanism of injury in ACL ruptures is usually an acute forceful rotation. The most common history is of someone twisting on a bent knee such as a footballer or rugby player suddenly changing direction (‘cutting’ – causing forceful internal rotation on a flexed knee) and then suffering sudden, severe pain in the knee. The knee may give an audible ‘pop’ or ‘crack’ as the ligament ruptures and the knee gives way. Swelling is often impressive and occurs within a few hours. Sixty percent of knee injuries presenting to emergency departments with swelling will have an ACL injury. If an ACL injury is suspected, referral to a specialist knee surgeon is recommended. Examination of the knee will reveal any instability – the tests used to assess the ACL are the anterior draw, Lachmann’s and pivot shift test (see video clips).